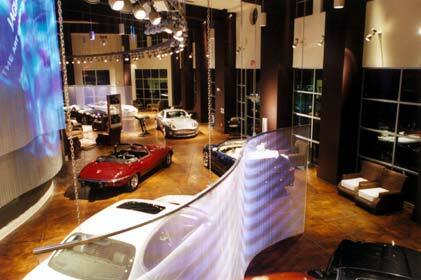 Tampa, Florida: Classy cars take center stage in a traffic-stopping showroom. Image: the sleek profile of a leaping jungle cat – a jaguar. Now, cast in chrome and put it on the hood of a car – talk about brand recognition! 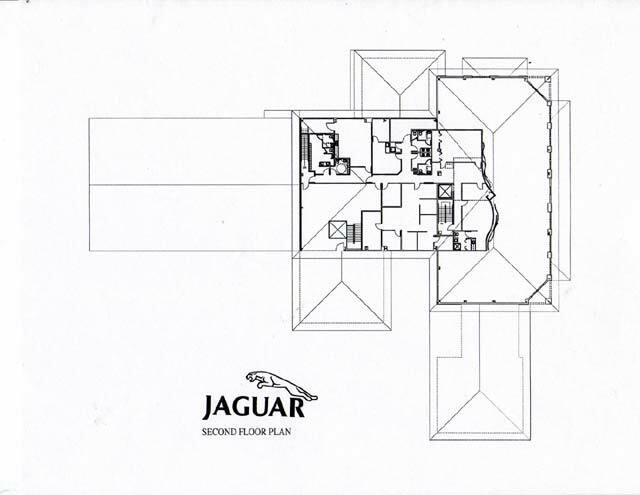 Jaguar continues to be one of the world’s most distinguished automotive brands with a rich history, highly identifiable styling (for the most part), and English pedigree – now with American (Ford Motor) parentage. 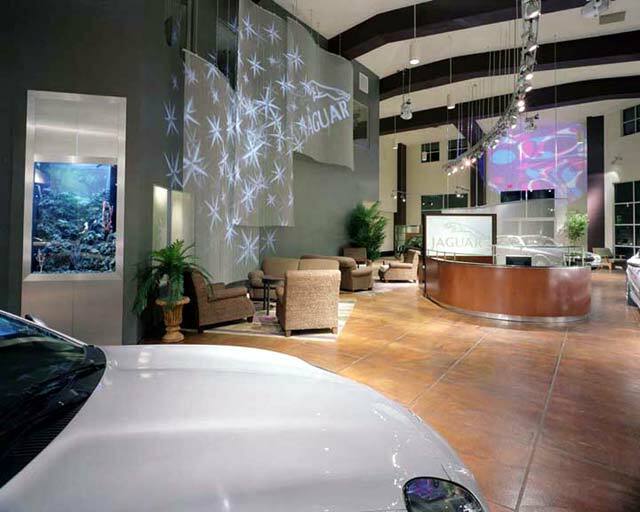 For the Jaguar of Tampa dealership, JGA, Inc., in close collaboration with Illuminating Concepts (IC), has created a sophisticated, theatrical setting not at all typical in car showrooms of any ilk. 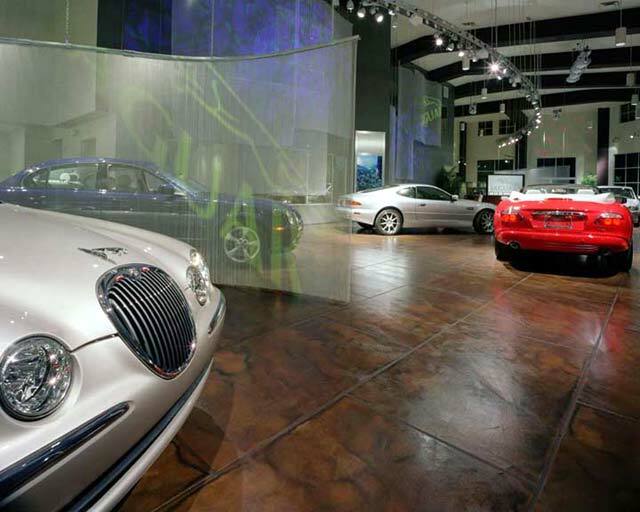 Visiting the 33,120-square-foot dealership is more like an “event” in viewing, purchasing, or servicing an automobile. “Unlike most retail, the challenge was not how to make the product a star, but rather how to highlight its star quality and create an appropriate setting – a habitat that implicitly brings to life the brand message,” says Ken Nisch, JGA Chairman. By the same token, the JGA/IC design team made sure that the environment was not one that projected “conspicuous consumption” – you’ll find no Austrian crystal chandeliers or blindingly polished marble floors here. It is a refreshing change from the gaudy and ostentatious “Auto McPalaces” or the generic glass-box, fluorescent-lit car showrooms that line so many American roadways (especially in Florida!). 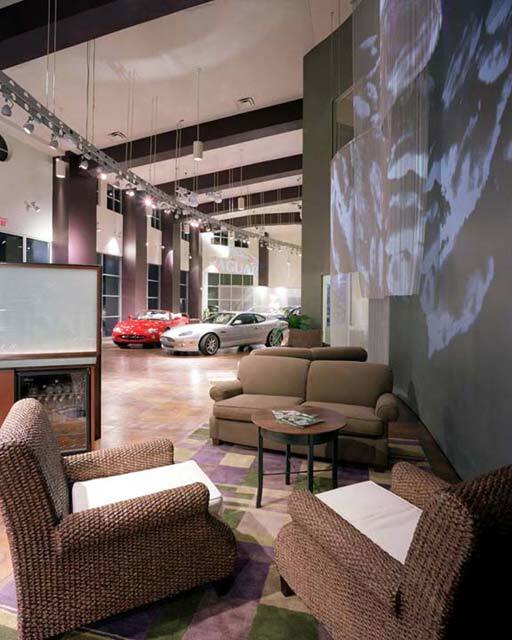 Seeing the dealership more as a campus, the natural landscape of the property – from a running stream to numerous live oaks – was preserved and enhanced to act as an informal and gracious backdrop for the display of automobiles. Generous curves within the landscape allow the customer to flow from one area of the campus to another, with the focus always on the main building. The setting allows a more welcoming, hospitality-based approach to the sales process. 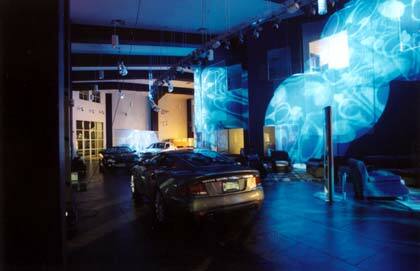 This tactic influenced everything from the nature of the exterior auto displays to the main showroom and service modules. One enters the double-height showroom through a pair of over-scaled, crafted wood paneled doors accented by curved extruded stainless handles, contrasting the adjacent steel-framed windows. The interior is what one might call “eclectic contemporary” that combines earthy with high-tech. 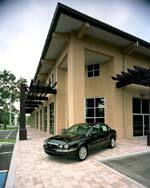 Industrial metal mesh scrims and stainless steel display panels – and the sleek, clean lines of the cars themselves – play against leather-like caramel stained concrete floors, dark stained timbers, a mix of crafted and eco-influenced furniture, and a large tropical aquarium that fills one wall. An expansive collage of mesh panels that forms a transition between the sales and back office windows overlooking the showroom floor accentuates the dramatic scale of the space. 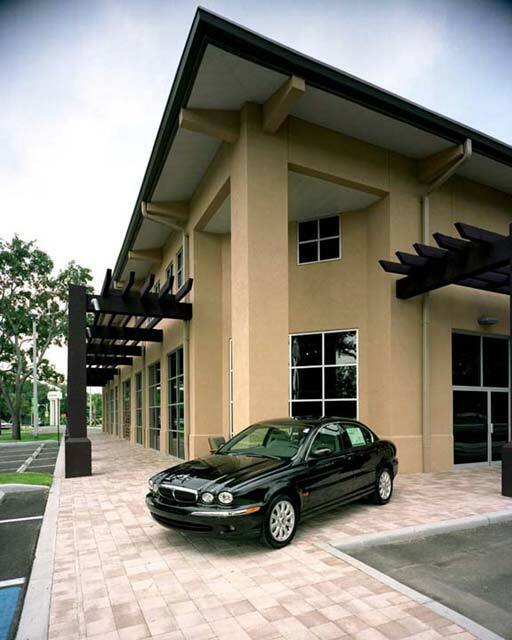 Sales interactions can also take place on a series of porches and terraces surrounding the main building where there are seating areas and service drop-off points. 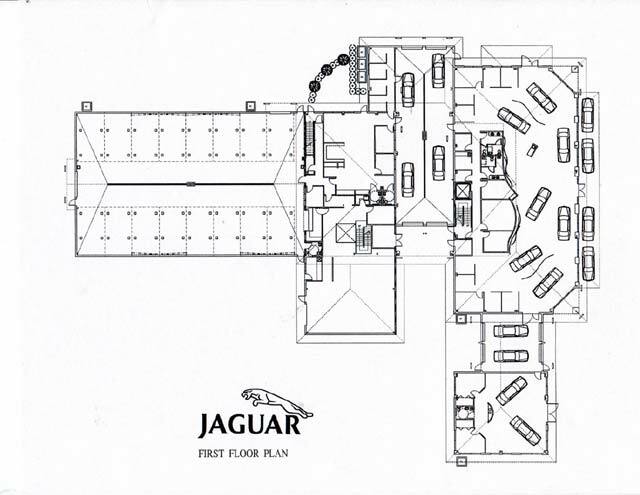 The customer waiting areas include an exterior patio, a flat-screen television, Internet-ready workstations, and an extensive display of retail products. 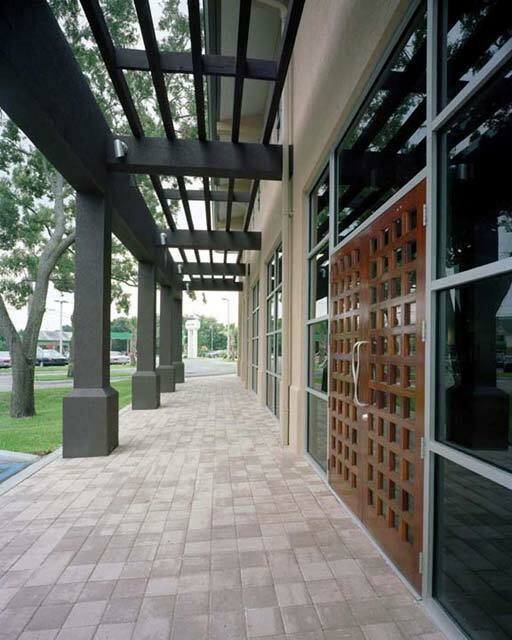 Since 1971, JGA has evolved to become one of the nation's leading retail design, brand strategy, and architectural firms. The firm’s expertise is in balancing space planning, brand identity, imaging, graphics, and merchandising. JGA clients include Audi, Jockey, Hot Topic/Torrid, J. Jill, La-Z-Boy, The North Face, American Museum of Natural History, Ripley's Aquariums, Henry Ford Museum and Greenfield Village, Hershey's, Avon, and GNC. Illuminating Concepts is recognized as a pioneer of turnkey “immersion experiences,” environments that saturate visitors with an array of enticing elements. For 22 years, the firm has provided clients with solutions for architectural, theatrical, and retail lighting, audio systems, water features, and special effects. IC’s branded software system, MediamorFX™, provides the artificial intelligence required to fuse each of these elements together automatically, essentially allowing Architects and Owners to tailor an environment to meet ever-changing needs. Adventure in Style: The North Face Beverly Hills by JGA, Inc. 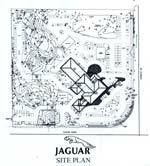 Custom Cuddles: Pawsenclaws & Co. by JGA, Inc.
Aston Martin Jaguar of Tampa: passers-by turn into the parking lot to watch the "show." The setting creates a more welcoming, hospitality-based approach to the sales process. Sales interactions can also take place on a series of porches and terraces surrounding the main building. 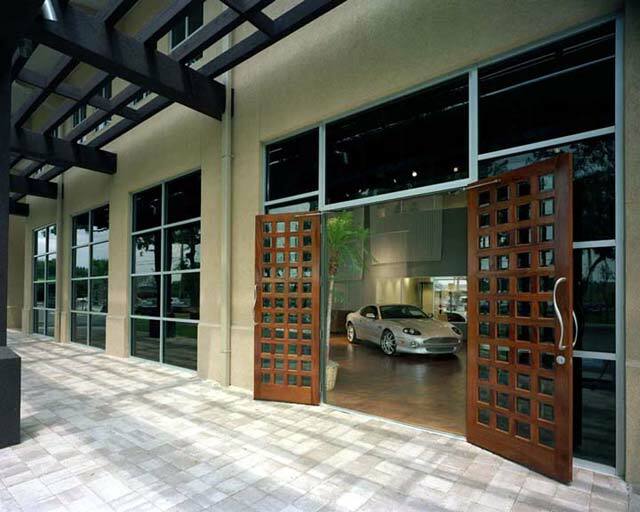 Visitors enter the showroom through a pair of over-scaled, crafted wood paneled doors accented by curved stainless handles. The waiting and reception areas offer a mix of crafted and eco-influenced furniture and carpeting in soft shades of tan and khaki; the caramel stained concrete floors lend a feeling of richness. 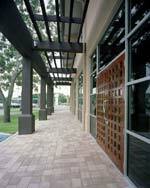 Customer areas include a large tropical aquarium, a flat-screen television, and Internet-ready workstations. The lighting and multi-media system creates a variety of scrolling and colored patterns, overlaid with brand logos, that are projected across the steel mesh screens and interior architecture. The chain mail scrim acts as a filter for independently displaying the distinctive luxury vehicles. The three-dimensional effects projected on the metal mesh screens provide a kinetic, theatrical backdrop for the vehicles. The lighting and audio system is programmed to switch to different modes depending on the time of day. 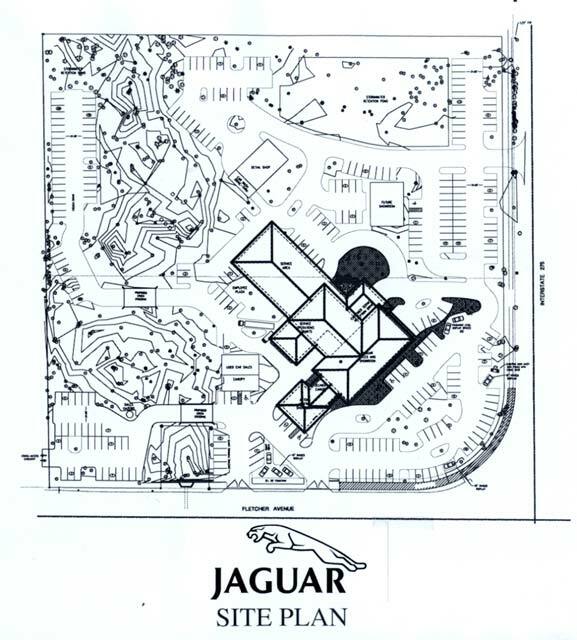 Site plan shows the campus/park-like setting.